Another addition to the bookshelf! And another addition to the bookshelf! The print edition of Overdraft: The Orion Offensive has arrived in my offices, and is now available. Amazon in the U.S. is shipping them right now, but they'll come online at other booksellers soon. Overdraft, as discussed here, is set 125 years in the future, at a time in which Earth has joined the commercial network of the Orion Arm of the Milky Way. Naturally, we've brought along some of our bad habits — including Jamie Sturm, a conniving stock trader who accidentally bankrupts his expedition from the comfort of his computer terminal. But Bridget Yang and her team of mercenaries refuses to simply go into unemployment: instead, they return to the Solar System to draft Jamie into service as an interstellar trader. They'll be taking him to the most dangerous places they can find to trade, until he gets their money back! The book was initially released as a Kindle Serial, and the full ebook can be obtained here. The trade paperback, at more than 400 pages, is now on sale — and preorders are also being taken for the audiobook, shipping in November. Be sure to check it out. You can also get the prequel short story here. Lastly, Brilliance Audio is handling the library sales for the book (yes, even prose copies): librarians, order it for your library system here. The ISBN number is 978-1-4778-0752-1. OVERDRAFT E-SIGNING: I am also offering an "e-signing", for as long as my supplies of the book last. If your mailing address is in the United States and you'd like a signed copy of the trade paperback, then e-mail me at the address at left; cost is $21 through Paypal (that's the $14.95 cover price plus USPS Priority Mail shipping, Paypal account is the same as the e-mail address). Be sure to include any personalization requested, as well as your return address, naturally! Contact me about international sales — postage would be whatever the USPS charges, but after a certain point it may make more sense to just download the ebook! You can find other books available on my Shop page. San Diego 2013 convention highlights -- guest-starring the Rebel Legion! Thanks to Joseph Setele for the photo! 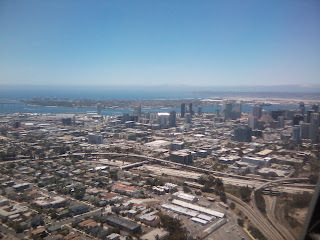 Back from San Diego, and quite a bit to round up here. In addition to being a great show, it was a trip book-ended on both sides with surprising Star Wars meetings. In San Diego, I met with lots of publisher friends and with fans, doing two signings with Del Rey. The publisher gave away Star Wars: Lost Tribe of the Sith copies, as well as Star Wars: Kenobi posters and a very special item: the Kenobi Krayt Dragon Call keychain. It's a version of an actual device found in Kenobi, and Leland Chee was able to locate the original sound file for the krayt in Episode IV for it. They were popular enough I could barely hold onto the things (and if you held too many too hard, you'd wind up with a hand that screamed like a wooly mammoth). Check out Leland's video of one here. As you can see at left, it's useful against Tuskens wherever they might be found! Leland Chee moderated a panel with me and several other Star Wars authors: Vader's Little Princess author Jeffrey Brown, Crucible author Troy Denning, and J.W. Rinzler — who showed the Star Wars gag reel he'd unearthed. Del Rey's Frank Parisi and Lucasfilm's Jen Heddle rounded out the panel with news on upcoming projects. I also did a number of interviews with various sites. Check out my video interviews with The Scoop and with ClubJade.net. RoqooDepot has all the Star Wars-related videos here. This was very cool — my 501st induction had come back in 2009, so it was time to get signed up with the rebellion as well! James Floyd of ClubJade has the presentation video here. Clearly, I'm speechless! I really do appreciate the kind gesture from the Legion. Now to figure out how to get both those badges onto my badge holder! I also got to speak to a lot of friends in the business and in fandom — including attending the Star Wars Action News Fan Breakfast and the Random House party — and there were a number of only-at-Comicon moments. 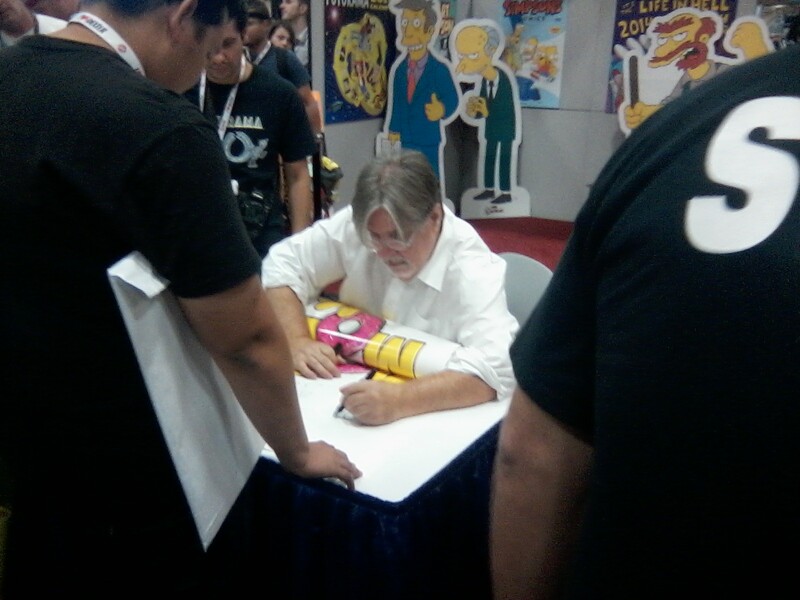 Visiting the Bongo Comics booth to talk Simpsons Comics, I looked up to see that none other than Matt Groening was there signing. The Springfield creator himself! And then later, while hanging out with old friend and fellow Star Wars author Michael Stackpole (who was there to promote his latest World of Warcraft novel), Dork Tower creator and Apples to Apples illustrator John Kovalic dropped by to demonstrate his newest movie-themed card game, Double Feature, for us. Look for it — it's a winner! Finally, on the flight out, Delta randomly seated me next to Star Wars Atlas co-author Daniel Wallace. We're crossing paths a lot: he also happens to be appearing at the Hernando, Mississippi library a week before I appear at the Kenobi release event at the Booksellers at Laurelwood in nearby Memphis on August 27. That — and Geek-Kon in Madison the weekend before it — is my next slated travel, and I'll need the breather to work on my various projects (and to get caught up on sleep). 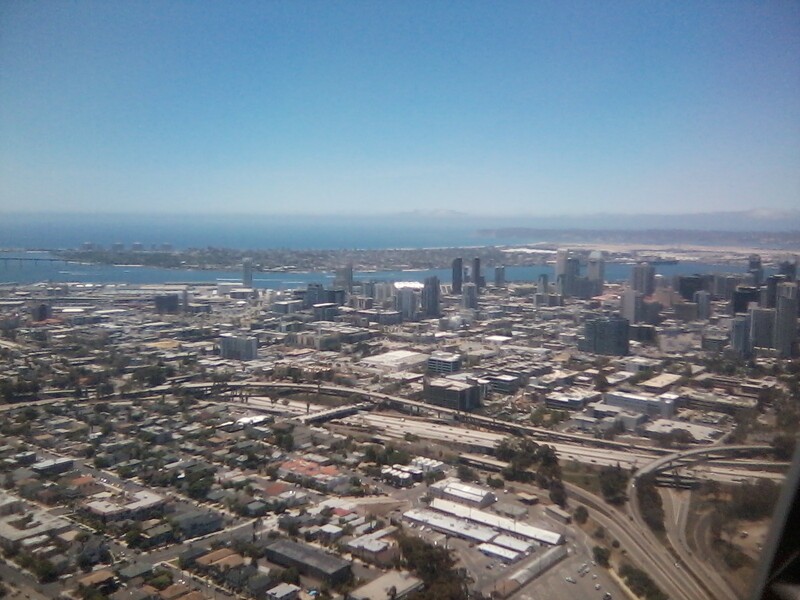 But after 19 years of visits, San Diego continues to be a unique experience not to be missed lightly. My thanks to the team at Random House, the Rebel Legion, Star Wars Action News, and everyone who made it a memorable experience for me. 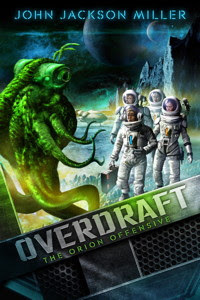 Also not to be missed: On Tuesday, the physical edition of Overdraft: The Orion Offensive releases. Be sure to get yours! The Del Rey booth will have their fiction sampler for giveaway, as well as posters and, while they last, copies of Lost Tribe of the Sith. I will also be around the hall at various times from Wednesday to Saturday. Interview requests while on the show floor, tweet to me at @jjmfaraway on Twitter— can't guarantee I'll get it in a timely manner, but I'll try. Reporting for duty: Star Trek: Titan - Absent Enemies! I mentioned with my Conan post yesterday that I'd been broadening my horizons this year with work in some other science fiction and fantasy sandboxes — and here is some quite fun news indeed that I've been sitting on for a while. I am delighted to report that I am writing a Star Trek: Titan novella for electronic release by Simon & Schuster/Pocket Books. Coming soon: Absent Enemies! 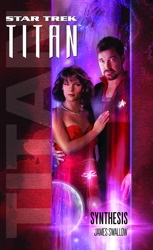 The Star Trek: Titan series tells of the adventures of my favorite and yours, William T. Riker, named captain of the Titan back in the final Next Generation movie. He's joined in the stories by a trusty crew including some familiar TV faces like wife Deanna and the former Voyager officer, Tuvok. There have been several works in the series, written by talented writers including Michael A. Martin, James Swallow, Christopher L. Bennett, Andy Mangels, and Geoffrey Thorne; Titan also appeared prominently in David Mack's Destiny trilogy. My own Absent Enemies picks up in the "present day" of the post-NextGen literature timeline — and it is inspired by and in part picks up on the events of one of my favorite TNG episodes. I won't say which one yet, but for years, I had thought the episode held the potential for another story to be told — and I'm happy to get to do it here. Riker is my favorite character from what I still think of as the "new crew," and I've been greatly enjoying writing him. I doubt anyone will be surprised that I've been a lifelong Trek fan (just as I've been a Wars fan, a Whovian, a Marvel Zombie, etc., etc. ); in fact, as I've mentioned here on the site, the very first prose fiction pitch I had accepted was years ago for the Starfleet Corps of Engineers series, back during my earliest days writing Star Wars comics. That line folded before the story could come to pass, and I ended up using one of the concepts in Pandemonium, the bonus novella in Lost Tribe of the Sith. Many years have disappeared since then, but not my interest; speaking both as a writer and a fan, I'm pleased to finally be writing a Trek novella after all. (And I'm pretty certain there are a lot more electronic readers out there today!) It doesn't even feel strange to commute between universes — I'm not even the first guy named J.J. to do so! There's no release date announced for Absent Enemies, but I'll keep you posted. 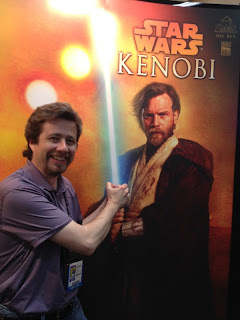 In the meantime, I can report also my San Diego Comic-Con signings have been set for the Del Rey booth in the Lucasfilm area: 2-3 on Friday and 11:30-12:30 on Saturday. And don't miss our Star Wars Writers panel at noon on Friday in room 7AB! I mentioned a ways back that I'd be doing licensed work in a lot of different areas — shorter pieces, in some cases, but in some sandboxes that I haven't written in professionally before. I am pleased to announce one of them now: I've written my first Conan story, to appear in Robert E. Howard's Savage Sword #6 from Dark Horse Comics! "Sargasso of Sand" reunites me with Philip Tan, the artist who drew "The Deep End" in issues #79-82 of my run on Iron Man, nine years ago. It's a fun short story, in which Conan encounters a madman who may not be as crazy as he seems. I saw the completed art for it just today, and it looks wonderful. 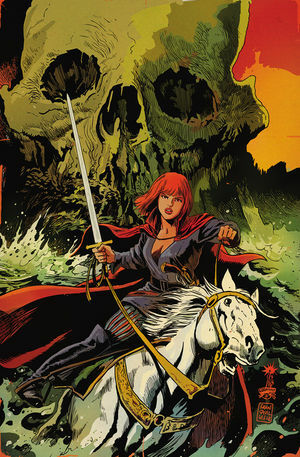 Savage Sword is an 80-page anthology magazine, and the current release date on the Dark Horse website is November 27. (Conan for Thanksgiving!) That's a different date from the one in the preorder link, but the link should still work. (Also, the line-up in that issue has changed since the solicitation to include my story — but the Dark Agnes image at left is still the cover, I am told. Overdraft print edition ships July 23 -- and a new Kenobi short story! 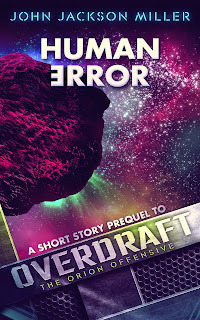 A couple of news items, about a pair of events less than three weeks hence: First, the preorder page has been posted for the print edition of Overdraft: The Orion Offensive, published by 47North. At 400+ pages, the trade paperback collects the entire serial — and it releases on July 23, exactly two weeks after the last serial episode goes online. Order it here. An order page has also gone up at Amazon UK — and other international markets are soon to follow. The book is also scheduled to be offered through many other book distributors and sites: the ISBN number is 978-1477807521. I'll add links to my site as they become available. 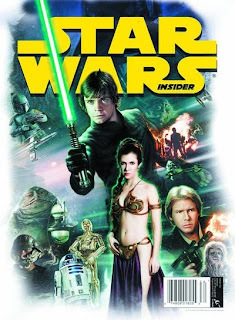 Next, in this month's Jedi Journals Forcecast podcast, Del Rey's Erich Schoeneweiss announced that I have a short story -- a prequel to Star Wars: Kenobi -- appearing in Star Wars Insider #143, shipping July 24. The story is illustrated by Chris Scalf, who drew the promo piece we had at New York Comicon. You can get the magazine at your local bookseller or preorder it here. 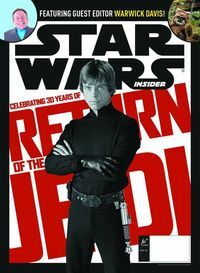 I'll share some more details as we get closer to the date, but this is, believe it or not, my first Star Wars: Insider contribution. I originally concocted the idea for "Labor Pains" with the intent of taking it to Insider many years ago; for one reason or another we would up publishing it on the Hyperspace website instead, where it became my first published Star Wars prose. 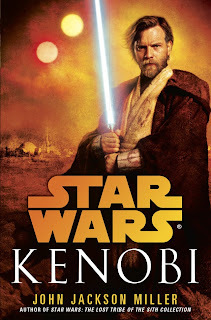 In related Kenobi news, the audiobook has been solicited for release the same day and is being read by Jonathan Davis, veteran of many other Star Wars releases. Preorder it here. The Goodreads drawing is still going on for another week for the signed Kenobi Advance Reader Copy: sign up here. And the book release event has been slated for my hometown of Memphis at The Booksellers at Laurelwood at 6 p.m on August 27. More details as they become available. Remember, you preorder the hardcover from Amazon, Barnes & Noble, Random House, and IndieBound.